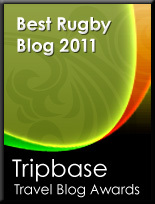 TOTAL FLANKER...a rugby blog: So am I retired or what? So am I retired or what? This really should be an easy question to answer. After all, I haven’t played a game of competitive (or even non-competitive) rugby since the game turned professional, since lifting was allowed in the lineout, since New Labour came to power. As far as I can remember, March 1994 was my last game, and that was after a long lay off with lower back trouble. That day I turned out at number 8 for the Sinners, a social side connected to Barnes RFC for whom I’d been playing for the previous three seasons. The match was against a similar side linked to Bishop Stortford RFC, we lost and I spent most of the match trying to look busy whilst avoiding too much contact as I was pretty sure my back wasn’t up to it. So, that was that – the season finished without me playing again, I got married in the summer of ’94, missed pre-season training for the first time in fifteen years, turned 30 and lacked any sort of motivation to start playing again. The following summer my wife and I moved out of London to Hertfordshire, and the thought of proving myself at a new club didn’t interest me one bit. Furthermore, I had no desire to test whether my body was still up to it. I’d played every season from 1979/80 through to 1993/94 - for school, county, college, university and a variety of clubs - and had picked up a collection of breaks, dislocations and ruptures, culminating in the lower back injury that had cut short my last season. I really felt that 30 was as good an age as any to call it a day. So why the question? Why should there be any doubt as to whether or not I am an ex-rugby player? The answer is Touch Rugby. Or perhaps the answer is a mid-life crisis, but last summer, at the age of 41, I decided to get myself down to Chesham RFC and get involved with a Touch Rugby league they run there. Why I did it I’m not entirely sure, partly because I needed to do more exercise and I’ve never been a huge fan of going to the gym just for the sake of it, but it was mostly down to the fact that over time I had missed the involvement, the being part of a team, the opportunity to contribute to a common cause, the beer. Being an unattached floater I was nabbed by the club chairman for his team and for the next ten weeks turned out every Tuesday evening. At first it was excruciatingly tough – lungs fit to burst, legs like jelly, face like a beetroot – but gradually my body learned to cope, I found that I could walk the following morning, and I found I was able to contribute more and more to the team. What’s more, purely by chance it turned out we had a pretty good team and lost only once during the “season”, finishing second overall. By July I was feeling in pretty good shape so when faced with the question, “So how do you fancy turning out for the Vets this season?”, I didn’t immediately rule it out. I decided, foolishly as it turns out, to give pre-season a go and then decide. The problem was that pre-season for me lasted precisely 20 minutes – that’s when my left achilles seized up resulting in nearly 2 months of physiotherapy and a loss of momentum which ruled out any glorious comeback last season. So, fastforward 12 months and the Touch season has kicked off again and I’m back playing in the same team – we lost our first game 9 tries to 7 on Tuesday with a much depleted turn out but played pretty well nonetheless. I’m fitter than last year and have really enjoyed it so far despite the accompanying aches and pains. So if the question gets asked again I can’t say what my response will be.